If you've ever wondered what Robbie Fox and his buddies have discussed in his mom's basement throughout the years, this is your chance to listen in on the conversation. From the world of nerd culture, to mixed martial arts, professional wrestling, music, and movies, there's no niche this show won't touch alongside guests both within and beyond the Barstool Sports bubble. Trent (of Fore Play) joins Robbie this week to recap not only just the roommates' incredible weekends, but the Game of Thrones Season 8 Premiere (which includes SPOILERS; skip forward to 30:05 to avoid) as well! Later on, Dillon Danis joins the show (30:05) to declare Robbie an official SBG Ireland "adoptee", explain the excitement that comes along with fighting at Madison Square Garden, discuss whether or not McGregor/Khabib's rivalry has gone to far, and address his own rivalry with YouTuber Jake Paul. Somehow, we got into Flat Earther theories once again. Just MOMENTS after leaving the Celebration Stage at Wintrust Arena, where the Star Wars Episode IX trailer/title were revealed for the very first time, Robbie sits down with KenJac (of Lights, Camera, Barstool) and Clem (of Podfathers, Game of Stools, and more!) to break down what they saw, how they felt about it, and what the future holds for Star Wars. We've got a full on 'From The Top Rope' show this week with a slightly delirious Robbie Fox and Jared Carrabis, fresh off WrestleMania 35, who reveal what landed for them throughout the night, what didn't, their match of the night, their worst match of the night, and much, much more! On the very first Friday Bonus Episode of My Mom's Basement, Robbie sits down with UFC Featherweight Champion Max Holloway ahead of his UFC 236 bout with Dustin Poirier for the UFC Interim Lightweight Championship, and discusses the "Diamond" rematch, Conor McGregor/Khabib Nurmagomedov's rivalry heating up, his son, "Mini Blessed", the future of his career - and a whole lot of Drake when Young Pageviews joins the show. Join Robbie Fox and his tag team partner Jared Carrabis on this week's 'From The Top Rope' edition of My Mom's Basement for an extensive WrestleMania 35 preview (6:34), prior to which Robbie addresses the Conor McGregor news (1:37), recaps UFC Philly, and looks ahead to UFC 239, the company's "International Fight Week" card (5:12). Robbie answers your questions at the end of the podcast (1:23:51)! 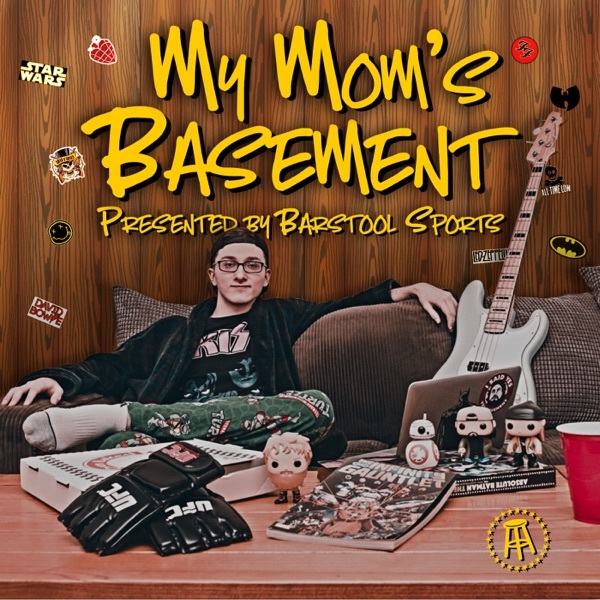 Join Robbie Fox on the very first episode of My Mom's Basement, where he breaks down all you need to know about what this podcast is/will be (MMA, Nerd Culture, Music, Movies, Pro Wrestling & More! ), interviews UFC President Dana White (6:23), and teases the topics and guests that'll be covered in the next few episodes! Welcome to the newest Barstool Sports Podcast hosted by Robbie Fox. First episode launches Monday, March 25th.